I visited this mosaic on a day I had met with Denis’s son Kevin, and had a chance to see some of Denis’s later works and momentos of the decades spent working on projects for Home Savings. Kevin mentioned Denis’s frustration in some of his last projects, battling the difficulties of the mosaic craft, the troubles of older age, and the flagging enthusiasm for these mosaic works. At the La Cañada branch, the diminution of the Home Savings works is evident: as the electrical outlet in this photograph suggests, the placement of this mosaic is happenstance, in the entry hallway to the bank, which does not have any of the other signals of Home Savings, like travertine facing. The mosaic is much smaller than the average Home Savings artwork, and it was installed in a metal frame — ready to be carted away as needed, without the cost involved with removing the mosaics from cement and permanent walls, as would be required in most of the Home Savings locations. Rather than placed high overhead, the mosaic is at eye level, allowing a far more intimate examination of the craftsmanship and a tactile appreciation for the tiles, design, and methods. I have not yet checked the relevant file at the Huntington Library, but I believe what Kevin told me, that the artwork is meant to echo the nearby Descanso Gardens, once again linking the bank to the community. 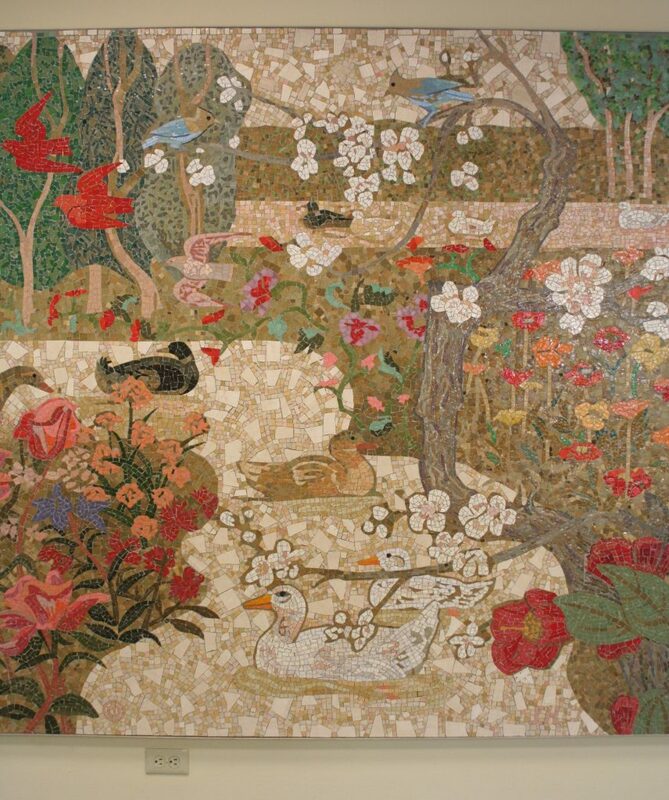 The ducks, roses, and trees over streams in the mosaic match nicely with the images of the gardens available on their website. Descanso Gardens are a bit of a hidden treasure–a preserve in the San Rafael Hills that held out against the post-WWII transformation of the LA Basin, and a park more muted than the region’s brashest and most well-known attractions. So too is this last Home Savings mosaic in California modest — but, in its intimate size and placement, a treasure worth the trip. This weekend I was on the Jewish World Watch walk to end genocide in Woodland Hills, strolling with thousands through the mostly deserted streets of the Warner Center early on a Sunday morning. But when we turned onto Victory Blvd., I saw it — one of the last Home Savings banks. I ran off the walk path and snapped some photos. This branch was in the news in November–apparently, Costco and the mall giant Westfield plan to tear down this former Home Savings to build a big-box store–with its back wall facing Victory Blvd. I spoke with Astrid Preston in the fall, who described her efforts to link the mosaic to the community, showing the mix of office towers and residential buildings in a leafy setting, much as the Warner Center/ Topanga Mall environs appear today. The Sheets Studio often started with historical sketches and photographs; this mosaic was more about the contemporary moment, and was researched by driving around the neighborhood. Second, you can see that there was an effort to maintain the look of the Home Savings bank, as we have discussed, but to try and do so with much cheaper materials and styles. Out went the hand-cut glass smalti; in came the painted, flat ceramic tiles. Out went the large travertine tiles; in came smaller specimens. And, most tellingly and least effectively, out went the Interpace gold tiles used to mark the roofline, and in came quite inferior metallic gold tiling, vertical and undistinguished. So the bank has a feel of Home Savings, but not the true romance and beauty of the original banks. I didn’t wander inside, but the interior looked undistinguished as well; I do wonder, as the LA Times article suggested, if the mosaic could be preserved and placed in any future wall along Victory Blvd. — something much more like what the original Home Savings had intended. I will take a break for Passover/Easter Week next Friday; more mosaics to follow after. True history needs its points of comparison and the proper context. So in this week away from southern California, I have turned to that aspect of the Home Savings project. This past weekend I spoke twice in downtown St. Louis, and took the opportunity to visit the local sights again: Busch Stadium, for the Padres-Cardinals opener; the Arch; the Old Courthouse–and the local corporately sponsored public history mosaics. The cover I originally desired for my first book was a detail from Fredrick Brown’s wonderful mural at the UMB Bank across from the Old Courthouse, focusing on the nineteenth-century figures appropriate to that project. Brown’s work stretches from the era of the Cahokia Mounds to Auguste Chouteau, Thomas Hart Benton, Dred Scott, Abraham Lincoln, Adolphus Busch, and on, to the Cardinals and the Arch; a great sweep of St. Louis history all in one place. A reception for the Business History Conference brought me back into the Metropolitan Square building, and a helpful suggestion from one of my book talks let me grab the building’s explanatory brochure, and learn how the artist Lincoln Perry has cleverly blended St. Louis sites with the story of Homer’s Odyssey. 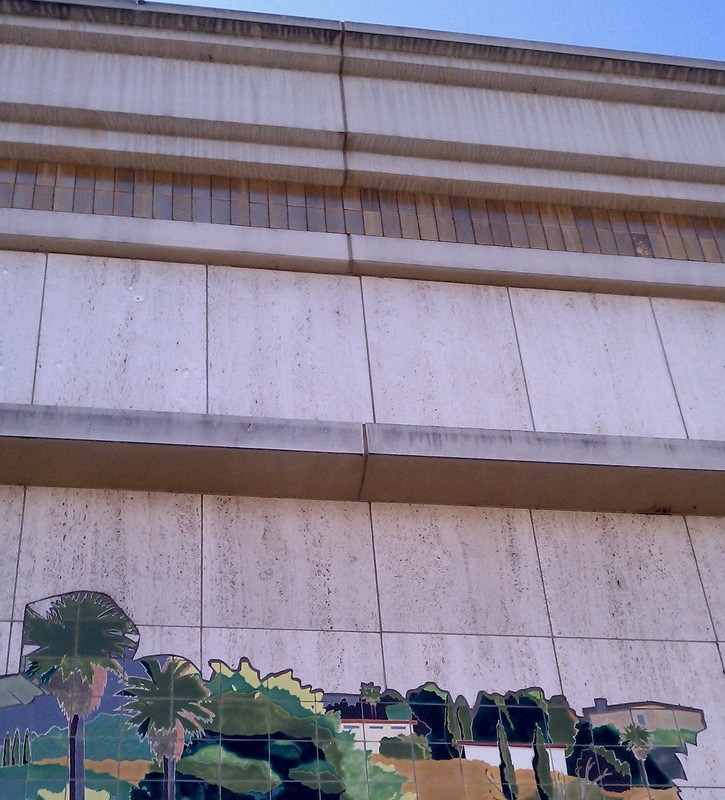 The then-and-now murals at the front of the building by Terry Schoonhoven (who has done extensive work in Los Angeles, including at the former Home Savings at 7th and Figueroa) showing the courthouse dome before and after oxidation and other details, show the efforts of the building to speak to the history of its local community–much like the Home Savings and Loan art and artwork. I have found there is a whole company dedicated to cataloging these art collections: the International Directory of Corporate Art Collections and its associated websites, with more than 1,300 corporate art collections listed! So coming up with an exhaustive list here would be impossible, but I am especially curious of other examples. So this week I have a challenge, dear readers: What examples of corporately sponsored public art comes to mind? (That knocks out collections mostly kept as investments and not constantly on display.) Sculptures are easy, so we will mostly discount them too — I want to find mosaics, stained glass, and murals, and I especially want to know if they depict the local community or history. 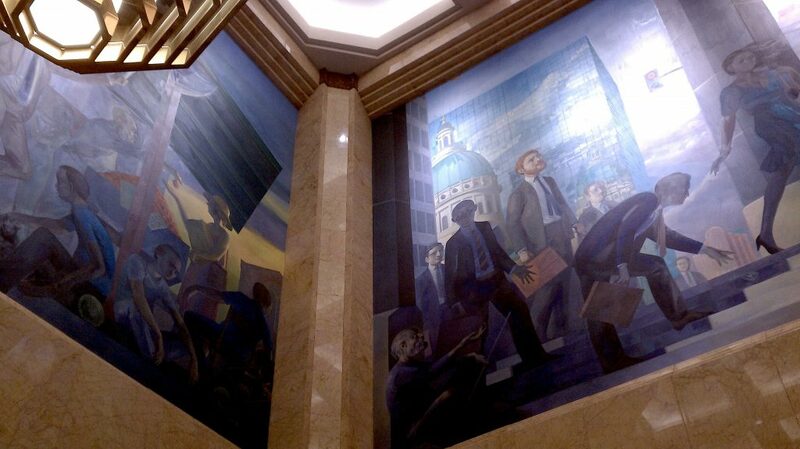 Which other corporately sponsored artwork comes to mind when you think about the Home Savings art and architecture?